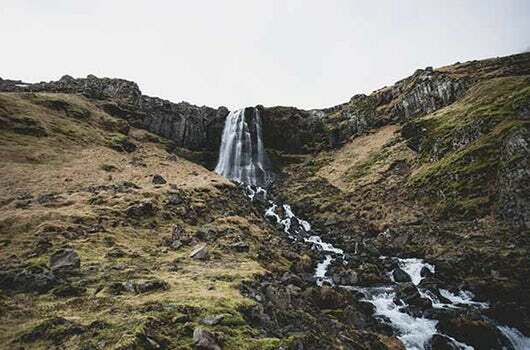 Spend the day in Snæfellsnes Natioinal Park, often described as “Iceland in Minuature” for its diverse scenery. You´ll see the mossy Berserkjahraun and visit Grundarfjörður fishing village where Kirkjufell mountain rise from the green hills, surrounded by trickling rivers. ​​Our next stop is at Djúpalónssandur, a beautiful black lava pearl beach, described by many as lava wonderland. 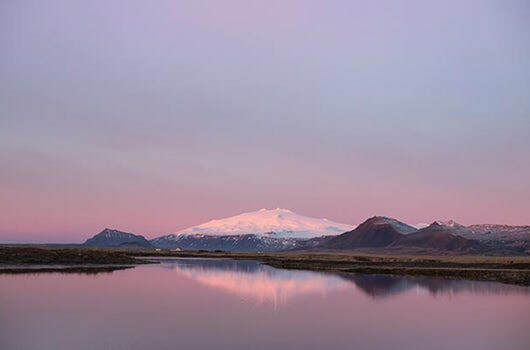 From there we go to the village of Arnarstapi, where you have a breathtaking view to the Snæfellsjökull Glacier, a famous site, primarily due to the novel Journey to the Center of the Earth, in which the protagonists find the entrance to the center of the earth on Snæfellsjökull. The day would not be completed without an Icelandic home-cooked meal with some local interaction. MT. KIRKJUFELL - Kirkjufell mountain rise from the green hills, surrounded by trickling rivers. DJÚPALÓNSSANDUR - Djúpalónssandur, a beautiful black lava pearl beach, described by many as lava wonderland. ARNARSTAPI - he village of Arnarstapi, where you have a breathtaking view to the Snæfellsjökull glacier.